Lost in a sudden winter storm, he found a trapper's cabin ... and a strange story of love and danger! Strange things take place in the north country, m’sieu, but I have known none more strange, or terrible, than what happened that night in the lonely cabin on Lost Creek, — the night the wind wolves danced. Ah, m’sieu, even now I can see the way that man lay there, the knife blade gleaming — what of it was not buried in his heart, and feel the cold fear that crept down my back. Ugh! But I should not dare tell this story to even you, m’sieu, was I not very sure you could never find the place. It was a bitter night, m’sieu, that I was caught in a storm up in the Height-of-Land country. Even the oldest woodsman is fooled sometimes, and the storm came up even quicker than I had expected, catching me many miles from my cabin. I thought I knew my trap line well, but after dark, when the snow devils build strange shapes out of the drifts, then tear them down again like children knock over play houses to make something else, familiar landmarks look queer and unnatural. I had no compass and the stars were smothered by the clouds that shook loose the snow that floated down, swirling, steady, suffocating, filling up trails and leavening valleys until the northland was one great white plain with no end and no beginning. Ah, m’sieu, for long hours I floundered helplessly in that night of terrible whiteness, utterly bewildered. The soft snow underfoot, clinging in the manner of new fallen flakes, seemed to be tugging at my boots, striving to pull me down. And the hard sleet pellets that flew through the air in a straight line stung my eyes till I was almost blinded and cut my face till the blood came. Then the frost crept in and seamed my skin with great, aching cracks. It is a terrible thing to be lost in the north country in a storm such as raced in a mad dance that night. The cold was a cruel, searching thing, that crept into one’s bones and sucked at the marrow. I stumbled along blindly, hour after hour, and always that terrible cold clawed at my vitals and always I could hear the wind devils howling like hungry wolves, eager for their prey. My throat burned from thirst, and each time I thrust a handful of snow in my mouth it was dry like chalk dust and I blew it out still unmoistened. I knew I was far off my trap line, wandering somewhere far into the lonely north, but I was even farther than I thought. Many times I fell, and each time it was longer before I got up. As I lay in the snow a strange warmth would creep over me and I grew drowsy — why not sleep, I thought; after all, what did it matter? And I knew that soon I should fall and not rise again. Then, with the sleep imps tugging at my eyelids until I felt I could no longer resist them, I saw a light. I tried to cry out for joy, but my throat was so parched I could utter no sound. I could see that the light was in a little creek, some trapper’s cabin, I thought, and stumbled toward it madly, rubbing my eyes with my fists to keep them open. Twice the light vanished, and each time tears came to my eyes, while I sobbed like a child. Then, each time, a lull in the whirling world of whiteness showed it again. I thought I should never reach it, and was sobbing from despair when suddenly I saw a shadow loom before me and I fell against a door. The next moment there was a sudden blaze of light that blinded me and a blast of warm air against my face. I was conscious of falling forward on a hard floor, and of a woman’s frightened cry. Then all was black. When I regained consciousness my first feeling was of pain, white-hot, searing pain that darted across my face like little streaks of fire. I moved and my whole body responded with a great swell of torture. I could not help but cry out from it, and I heard a quick stir at the other side of the room where I lay in a bunk. 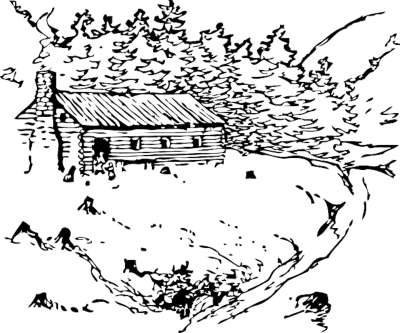 I turned my eyes and saw a cabin typical of the trapper’s shacks scattered throughout the north country, with a rifle over the fireplace where pine sticks blazed, and great bunches of furs hanging on the walls; rich, glossy pelts of marten and fox. Then the girl bent over me. M’sieu, she was beautiful. She was young, not more than twenty, I thought, and her skin was white like new milk shaded as by rich cream from wind and sun. Her lips I should have sworn were painted had not the cut of her belted dress and the way her black hair was piled loose on her head told me here was a girl who knew little of civilization. She was a wild thing of the woods, sweet and beautiful like the flowers. The hand she laid on my head was soft and cool, and, m’sieu, I swear it, under that touch the pain left as snow melts before the breath of the Chinook in the spring. “You are safe,” she half whispered the words, and threw a nervous glance over her shoulder toward the door. Then she smiled, but still I saw fear in her eyes. She brought me hot broth then, and scalding tea, that loosened a little the grip of the frost devils in my body and set the blood flowing more freely. But still I could not get up, for my legs were swollen and aching with the rheumatism in them. The cold of the north does not easily let go its grip. That day I lay and watched the girl move about the cabin working, cooking over the small stove in one corner, sewing, or turning drying pelts that hung on the walls. But always she seemed listening, and at each sound at the door she started nervously. Often she would press her face to the window glass, striving to pierce the terrible murky whiteness outside. For the storm still tore on in its mad dance, and made the day almost dark as night so that the lamp had to be kept burning. And as I lay there watching the girl, who every now and then threw a half fearful glance at me, or staring at the smoked rafters of the roof, I had a feeling that here in this cabin I had stumbled on some mystery of the north — which hides so much that is terrible and tragic. The wind screeched mournfully over the chimney and I got to fancying that at times it laughed, yes, m’sieu, actually laughed, like some fiend that watches and waits for the enacting of tragedy to satisfy its bloodthirsty humor. And I wondered what it was out in that white storm that the girl feared. The day wore on, and again the great darkness stole over the north country and blotted out the dim light that filtered through the falling snow. And with the night the girl’s nervousness and fears seemed to increase. The frost in my body was so loosened now that I could turn and watch her better. Several times I tried to draw her into conversation, then, after awhile, she came and sat by my bed. There was that same fear in her voice, and something else I did not know, whether hope or merely wonder. Then I told her how I had got caught in the storm and became lost, stumbling upon the cabin by accident. She went on at my look of wonder. The door rattled then and her face went suddenly white as the floating flakes outside and she threw a quick look of fear over her shoulder. She turned to me again with a little shiver of relief. “It was only the wind,” she faltered, smiling feebly. I raised myself on my elbow then, and seized her hand that lay on my bunk, like the hand of a child that seeks company in the dark. She drew away with fear alive in her eyes. But I was persistent, and, woman-like, in her heart she did want to confide in someone, and then — she told me. She was an orphan, left when she was very small in the care of an uncle, who had always been what people call queer. She told how she had known him to sit for a whole day at a time, silent and moody, taking no note of what went on about him. In the winters he trapped, but he made no friends and, in fact, so much as was possible, avoided contact with other people. She loved him, for he was her only relative, and cared for him tenderly. And though there were other people who were inclined to be frightened of him, he was like a child in her hands. A great affection for her grew in his heart as the years went on, and he came to be restless and uneasy whenever she was out of his sight, as though he was afraid he should lose her. They lived, the two of them, far up in the Height-of-Land country a many days’ journey from any post. But I have said she was beautiful. M’sieu, do you know there is about a beautiful woman something that draws men, even from great distances, like gold? Ah, m’sieu, nature cannot long hide her two greatest treasures. So it was that a lover came. He was a trapper, who stopped at the cabin one spring as he was on his way south with his winter’s catch of furs, and there he saw the girl — her name? Ah, m’sieu, that I never knew. After all, names matter so little in this world. Those two loved each other from the first, and therefore that summer the young trapper came often to the cabin. The uncle saw all this, and there awoke in his mind that latent fear that the only thing that had ever awakened a bit of affection in his heart was to be taken away from him. He threatened the trapper, but the young men of the north are brave. The lover laughed at him. Then the devil that had been brooding in the uncle these years awoke and stirred to life. The man became a maniac, with but one idea In his distorted mind, that to keep the girl from being taken away from him. In his young days the uncle had once trapped in a country far to the north, where few men ever go, and in that sad and lonely country there was known to him a hidden creek where one might live for long years and never see so much as a wandering Indian. And it was that one night the girl was awakened from her sleep to find the mad uncle commanding her to rise and come with him. He had a canoe packed with their belongings, ready in the river near their cabin. She looked but once into his eyes and saw there the devil light that told her it was useless to resist. She knew he loved her, in his savage, selfish way, and would not harm a hair of her head so long as she obeyed him. But if she did not, she knew he was mad. When morning came they were far up the river, and there were none behind who knew whence they had gone. The girl had tried to leave some message in hope that her lover would find it and follow, but the madman suspected she would try such a ruse, and watched, making it useless. For three days they paddled up the river, and the fourth day the uncle transferred all the duffle to the bank and sunk the canoe. Then for three more days they traveled far up into the north, twisting and turning in strange regions where the girl lost all sense of direction and knew she should never find her way out. The fourth day they came to the little cabin on the hidden creek where the uncle had trapped one winter and where no man had been since. He repaired the house and there they lived, the girl desperately hoping that some day her lover, who she knew was scouring the northland searching for her, would find the place. The madman, too, knew the lover would search until he found his sweetheart, or died, and always he watched the rims of the surrounding hills, his hand caressing his gun and the devil light gleaming in his eyes. And gradually there grew up in his heart a hatred of all mankind because one man had dared to covet the only thing he loved. And now, in his perverted mind, he came to fancy all men were leagued together, aiding the lover in his designs. And in his sleep he would mutter terrible threats that boded of evil to whatever man should set foot in the valley. So that, m’sieu, was what the girl feared. For the uncle was out running his trap line when the storm broke and now she feared he might return at any time. And if he should come back, and find me? I tell you as I lay there in that cabin I cursed the frost demons that held me helpless. Sometimes, as I listened to the terrible whine of the storm and felt the cabin shake in its grasp, I thought that perhaps he should not return, that the howling wind wolves would have their prey. But then, in my heart I knew it could not be so, for evil in a man makes him hard to kill. I tried to quiet her fears, but there were too many in my own heart for my words to be convincing. That night I came to know fear. With the girl I started at each sound at the door, and terrible imaginings crept into my mind. The girl sat by the fire and sobbed softly, while I lay awake, watching, listening. And always I could hear those wind devils, laughing, actually laughing. They were waiting. Then, after a long while, I fell into a fitful sleep and had bad dreams. It was with a start that I awoke suddenly, conscious of a man’s voice. Ah, that voice was born of the wind devils that howled outside in mad glee. Deep and rolling, it was savage like a maddened bull moose’s. But rising above it, high-pitched and stabbing like a dagger, I heard a woman’s frightened scream. I opened my eyes and for an instant I saw the girl, back to me, struggling fiercely beside my bed, and heard her crying desperately. Then he laughed, laughed like the bloodthirsty wind devils outside. Suddenly the girl was flung aside and I saw a towering hulk of a man looming over me, huge, foreboding, like a great pine tree towers over one in the dusk. His face was close to mine, and, after these many years, I can see that face even now … and shudder as I did then! It was a round, evil face, with a black beard that fell almost to the great chest, and with long, shaggy eyebrows. But it was the eyes that ^ere so terrible, gleaming with the light of the devil. They were the eyes of a madman. He laughed again, then, and I felt his rank, tobacco-laden breath on my face. And as he raised his hand I caught the gleam of the knife. Then I forgot I was weak with rheumatism, forgot the frost demons that held me down, and with a mighty effort tried to rise. The devils that still lurked in my bones growled, and sank their claws afresh in my vitals. I gave a cry, and fainted even as I saw the reflection of the firelight running up and down the knife blade in glittering streaks. But before I went I heard a strange thing, heard it dimly as in a dream. It was the girl’s voice, high-strung and poignant, and there was no fear in it, but a gripping something that came from the heart. She was crying out a name, madly, hysterically. That, m’sieu-eu, was all I heard. When I again came to, I was lying on the bunk, as before, and for a moment I thought I must have been dreaming. Then I saw the pine fire blazing, and noticed the hearth was piled high with sticks, in the manner of a fire stocked to last a long while, and at the side of my bed a small table held food enough for several meals. I also felt that my face had been freshly treated with grease and bandaged. I moved cautiously and found that the frost devils had loosened their hold on me and I could use my muscles freely. Soon, I knew, I should be well as ever. Then, I missed something. It was the howling of the wind wolves outside, and I knew the storm had finished its mad dance and blown its life away. Then, with a start, I thought of the girl, and the madman, and the glittering knife. I called, but no one answered. Yet I felt there was some presence besides myself in that room. I raised myself on my elbow and, ah, I shall never forget what I saw, or the cold fear that ran down my back like an icy finger as I looked. He lay there on the floor in the center of the cabin, the madman, and his lips were parted, showing his teeth in a hideous snarl. And his eyes, ah, m’sieu,, the devil had left them, now they were cold and colorless, like the ice on the frozen rivers. But what fascinated me was the knife that gleamed — what of it was not buried in his heart, and the blood that was thickened in a little pool at his side. I got one leg out of the bunk, then the other, and staggered to my feet. For a long while I stared at the horrible thing lying there on the floor, with the hideous snarl frozen on the lips, then again I thought of the girl. I stumbled to the door and threw it open. For a moment I saw only the great snow field that stretched off to the horizon, dazzling white in the sunlight. Then I saw something else. M’sieu, what I am going to tell you may sound strange, but I swear by the saints it is true. You may say that providence does not bring about such coincidences as to lead a heart-broken lover, wandering over the northland, to a hidden cabin on a stormy night just in time to — ah, say what you will, m’sieu, I swear it is true, that there, streaking off across the white plain, like twin threads, I saw two trails, a man’s and a woman’s, that spun away toward the south, where they merged with the horizon haze in the distance. There is little else to tell. My strength came back quickly, as it does to us who live outdoors, and so soon as I was strong enough I dug a grave back of the cabin, and there I buried the madman, with the hideous snarl frozen on his lips. The second day I packed provisions and followed the two trails that spun away toward the south. And so treacherous was the country that I had gone but a few miles until, looking back, I was sure I should not be able to again find the hidden creek, were the trails obliterated. Lost Creek, the girl called it, and it was well named. Nevertheless, I carried with me the knife I had drawn from the madman’s heart, and which I had seen was not his own. Three days later I threw it through an airhole into the racing Asthasbasca, where the two trails I had followed ended on the clear ice of the wind-swept river. Then, with my sense of direction restored, I turned toward my own country. That, m’sieu, is all I know of the matter.